Parking Lot Striping San Antonio is the professional striping company that you have been looking for to service your business. Many people never even think twice about the painted stripes on a parking lot, but as a business owner, you probably think about it more than the normal person. With good reason too, because making a great first impression is very important for any business, and quite honestly the best place to make that first great impression is right in the parking lot. From the second your visitor pulls onto your property you are now responsible for their safety. Having properly marked parking spaces, fire lanes, handicap areas, loading zones, crosswalks, and speed bumps are all great ways to let your visitors know that you care about their safety. That fresh coat of paint on the asphalt will look great too. We have been servicing San Antonio and the entire metropolitan area for many years and it has become a passion of ours to help keep the city looking spectacular one parking lot at a time. We use the highest quality materials and the latest technologies to ensure the best coverage and the longest lasting paint job to protect your investment. We understand that striping a parking lot is not the most glamorous thing to spend your money on, however when it comes to compliance, safety for your customers, and an overall beautification of your property this becomes a huge responsibility for us. We look forward to taking the challenge and providing you with the best experience possible. Hiring experienced professionals is very important when it comes to your parking lot. We understand that, and we want to be the professionals that you select to take care of the job. No matter if your parking lot is asphalt or concrete we will make sure the lines are accurately placed. The lines will not only be straight but will also be consistent in both color and width due to us using the highest quality paint material and equipment. We take pride in painting the straightest lines in the entire San Antonio, TX area. We specialize in providing the highest quality pavement marking services to ensure a long lasting and fresh appearance. 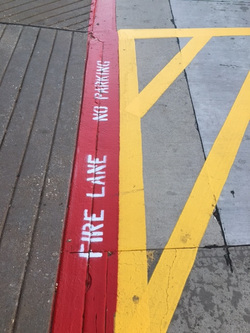 Keeping your fire lanes clearly marked is not only a safety issue but is also a matter of city compliance. You do not want to get a visit from the fire marshal because your parking lot is not up to code. Take the initiative and get your parking lot re-striped before you end up getting a fine. Never fear there is no need for you to try and understand all of the fire codes for your city. We have you covered. We understand all of the codes for the area and we will make sure your parking lot stays in compliance. When you call for service we will be glad to review your current lot and let you know what you need to stay compliant so you do not get that visit from the fire marshal. Have you ever heard of the ADA (American Disabilities Act)? I am sure you have because it has been in effect since 1990. The ADA requires every business to have a mandatory number of handicap accessible parking spaces available to visitors. This requirement is based on the number of parking spaces per 1,000 square feet of utilized parking space. If you have a larger parking lot, you may also be required to have van-accessible handicap parking areas. Just as with fire lane compliance, we understand these codes and will make sure your parking area is compliant. We will discuss these requirements with you when providing you with a free quote. 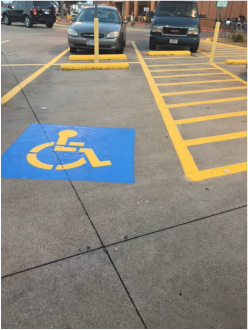 Rest assured we will be able to mark, stripe, and stencil your handicap parking stall areas. Speed bumps are great for slowing the speed of vehicles while they are on your property. We are experts at speed bump installation and removal. If your lot happens to have old speed bumps that need to be replaced, we will be glad to remove the old speed bumps and install new ones for you. Maybe you do not have speed bumps currently but realize you do need them, we will be glad to properly install new ones for you as well. If the existing speed bumps in your lot are in good condition, we can freshen them up with a nice coat of paint, to ensure that they are easily seen. Making sure the speed bumps are easy to see is important for both vehicles and pedestrians as well. We want to make sure that vehicles see the speed bumps so they do in fact slow down before hitting them at a high rate of speed. High visibility is also important for pedestrians so they do not trip over the speed bumps while walking from their car to your building. Wheel stops are typically used to prevent serious damage to buildings, walls, and other vehicles. They are also used to let drivers know when to stop and keep their cars off of sidewalks and grass areas. Just like speed bumps we are experts when it comes to installation and removal of wheel stops. We will make sure they are installed properly and easily visible to both vehicles and pedestrians. Keeping traffic moving in the proper direction is key when it comes to parking lot safety. The best way to keep traffic moving is by the use of directional arrows. For many businesses, arrows may not be needed, but for certain parking areas like banks, fast food restaurants, and car washes, having directional arrows painted on the lot will keep traffic flowing in the right direction. Having proper signage in your parking lot will help with keeping the traffic flowing properly as well as help with the safety of the patrons while on your property. Keeping everyone informed using signs is huge when it comes to safety issues. We also offer pressure washing services for your parking area. We actually suggest that before every job that a pressure washing occur to ensure the best adhesion results. Our goal is to provide you with a striping that will not only look good but also last a long time and protect your investment. Existing parking lots get really dirty, and getting a good cleaning is imperative to prolonging the life of your striping. Parking lots over time will get littered with gum, grease, oil, other vehicular fluids, rubber tire residue, bird droppings, dirt, and so much more that you never even think about on a daily basis. Giving your parking lot a much needed and often times overdue pressure washing can revive a dull lot, and also help prolong the life of your property. When it comes time to restripe your parking lot, finding the best price is typically a concern for most business owners. Staying on a budget or under budget is the goal of every business we have worked with. We understand as we are a business as well and also have a budget of our own. We pride ourselves on having very competitive pricing throughout all of the San Antonio metro areas. When it comes time to stripe your parking lot, please call us for a free quote. We will come out and determine the scope of the project. We will look at things like how many parking spaces are in your lot, how many handicap stalls are needed, fire lane placement and stenciling. We also consider if you need wheel stops and speed bumps installed or removed. We typically suggest that we pressure wash your entire lot prior to striping, to ensure maximum adhesion for the striping paint. Every parking lot is similar but different so once we come out to take a look we will know exactly what needs to be done and will include all of the items in the free quote. Rest assured there is no job that is too large or too small for our crew to handle, and we look forward to providing you an excellent quote and then earning your business. We are the leaders when it comes to pavement striping and parking lot maintenance. Due to our extensive training on the latest techniques, and top-of-the-line equipment we have become the go-to guys when it comes to all things revolving around parking lots. Businesses around town have been taking note, and we service many different types of businesses in the area. We look forward to helping you out with your next project as well. We service cities in and around San Antonio. No matter if you are a brand new business with a brand new parking lot, or if you simply need a fresh re-stripping of your current lot, we are ready to assist. We work with both asphalt and concrete parking lots and will have you covered when it comes time to start your project. If you happen to not see your type of business on the list never fear. We cant list them all, however, if you have a parking lot, rest assured we can assist you with all of your parking lot needs. Simply give us a call.